I have read many books in 2016, but it wasn’t all good. Some books, however, deserve to be acknowledged. I broke down my recommendations by categories: technical, non-fiction and fiction. There is no particular order. I have a similar post for 2015. Is this a technical book? It deals with technical topics (virtual money, blockchains, cryptography, mining…), but it has cute cartoons to help explain some of the concepts. It reminds me of my review of Economix – edutainment: learning while being entertained, it’s the best. Does Bitcoin have to be this complicated? Can it not be explained simply? I think this book managed to explain everything in the simplest way it could be done. It also tried to stay away from the temporary aspects of Bitcoin (specific websites or software) and focus instead on the ideas that won’t change as time passes. I saw it in a bookstore. Then, I stumbled on an article in the New York Times. Then, suddenly, everybody was talking about it. It’s a small inexpensive book, so I decided to buy it and see what all the fuss was about. Did it change my life? Maybe. I’ve never been much of a hoarder, but I have rooms, closets, drawers, and boxes that aren’t exactly tidy. When you think about why you’re holding on to physical things in your life, you probably don’t have good reasons. The things you own end up owning you. The book proposes a test: take something you own and ask yourself: does it bring you joy? No? Throw it out. Then, keep doing that with everything you own. It made me throw out A LOT of things. And it made me feel good about the process. I wouldn’t elevate this to a religion, like some people have … but it’s worth a read. A whole book on brainstorming. This book was mentioned in an interesting article from Nick Bentley. Everybody knows how to brainstorm, right? You just blurt out your ideas and … you’re not supposed to judge and … magic happens! That’s mostly it – but it’s good to understand the what and the how. In practice, there are many ways to brainstorm badly and few ways to do it well. I’ve read other books that tried to explain how to do it – and other books that explained why brainstorming doesn’t work. Main takeaway: you can brainstorm by yourself (some people argue that’s the only way it’s really going to work) and you need to KEEP PUSHING, especially when you think you’re out of ideas. You need to get to the 3rd third. Whether or not your job requires acts of creation, it inspired me to think outside the box and to come up with more ideas than I usually would. Many people and many blog posts have independently recommended this book. And yet, I can’t say that the idea of the book, nor its title really excited me. I found it, by accident, in a bookstore and remembered it was supposed to be really good. I bought it on a whim. Wow… this book really made me think. It made me question how I communicate with others. And I think, now more than ever, it’s a very important book to discuss how we communicate with each other as a society. I never realized how violent we are to each other. But if you think back about our origin as a species, about tribes and dominance, you’ll find that most of the things we say to each other carry cultural baggage. If you’re still not sure, you can watch videos of the author discussing NVC (nonviolent communication). Climate change is real, but maybe a bit abstract. Even if you don’t believe in climate change, you might wonder what will happen when we run out of oil. where is this energy coming from? what can we use instead of oil and coal? how do we deal with the unpredictability of wind/solar? This book skips the politics and deals quantitatively with the problem. How much energy is there in a gallon of oil? How much energy do you need to move a car? The physics is going to be explained to you, and you’re going to make these calculations yourself. This book paints a sobering picture of the current situation but offers alternatives. Sooner or later, we’re going to have to make some changes – whether we like it or not. I found this book on Bret Victor’s Climate Change page. Most ideas about what’s “green” or what’s good for the planet are not based on science. I don’t want to oversimplify because I think this book can explain it better than I can. I kept hearing about Vernor Vinge. I started with his Zones of Thought series, which I enjoyed but can’t recommend without serious caveats. 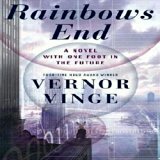 Rainbows End, meanwhile, is a self-standing book about an unspecified near future, augmented reality, ubiquitous computing, AI, mind-control … a vision about the impact of technology on society. 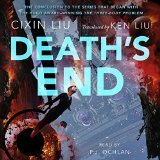 If you want good science fiction that goes beyond “aliens-and-spaceships” with a story that makes you think, I recommend you give it a try. This is the last book in the “three-body” series. I read the first two books last year and recommended them. At that time, I hadn’t finished the series because this book hadn’t been translated yet.